I’ve apparently had a fascination for all things electrical and electronic since an early age. So the story goes, I managed to jam some keys in a power-point aged about 3, apparently blackening all around it but leaving me unharmed. In my teenage years I knew to scream out “I’m OK” if – alright, when – my tinkering resulted in a trip of the house’s solitary circuit breaker and plunged the place into darkness. 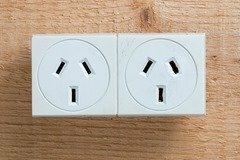 Electrical safety is something I think we all too often take for granted, perhaps these days lulled into a false sense of security by earth leakage circuit breakers, aka RCDs and marketed more commonly here in Australia as “safety switches”. These “Residual Current Detectors” have a tiny differential relay in them and fire – tripping the circuit – if the current that’s going out the Active wire isn’t ALL returning via the Neutral, the logic being that some’s being shunted to ground elsewhere – maybe through you. One menace these things aren’t going to protect you from is fire, and an electrical circuit can cause one of those when some resistance is encountered where it’s not meant to be – or too much current flows through a cable or joint of a given resistance. I’ve never forgotten this quote from an electrician I used to work with. I don’t remember exactly what the scenario was, but his matter-of-factness in commenting on resistance in a mains circuit ensures this quote has stuck with me for 15 years. You’ve possibly felt the flex going to a high-powered heater or portable air-conditioner and noticed it’s warm: that’s an example of the current flowing in the wire transferring energy in the form of heat. The higher the current that flows, a much larger amount of Power is consumed thanks to Ohms Law, where P = (I^2) x R. (Reference: “Joule Heating“). Overloaded cables – perhaps on circuits loaded up with too many devices/appliances – is one cause of electrical fires. 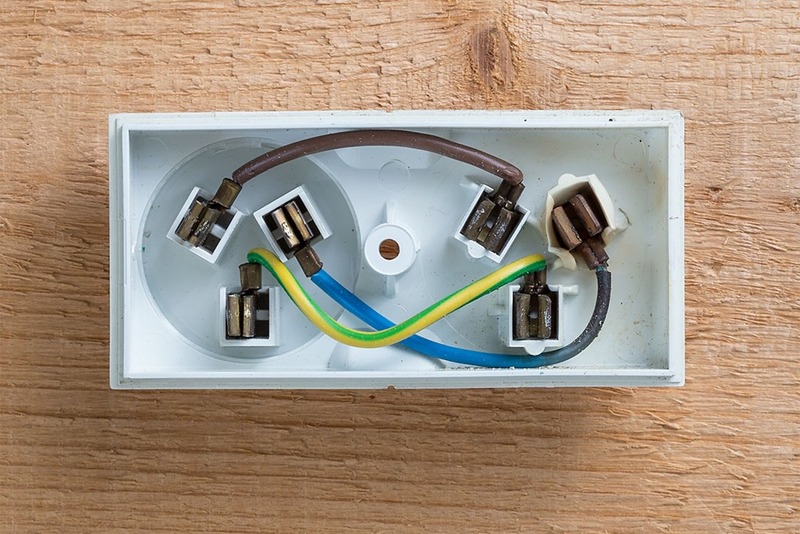 Poor joins in cables is another – and every time a plug meets a socket you have a “joining” of those conductors. 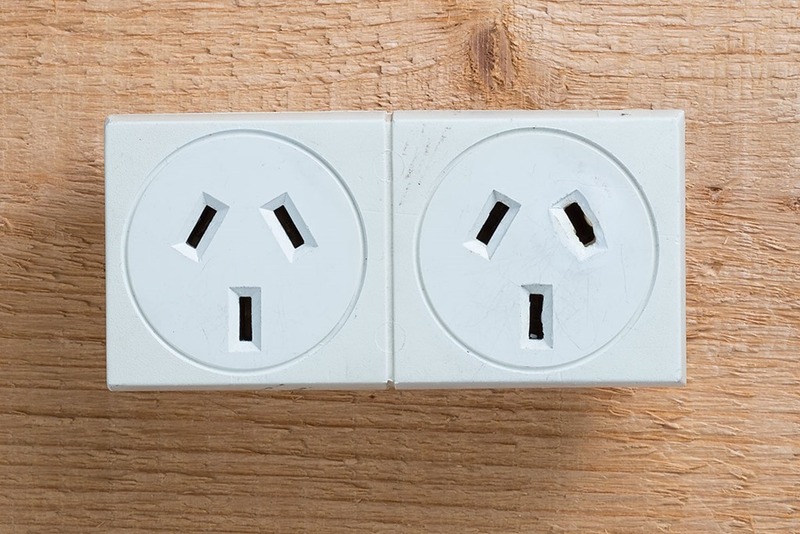 Daisy-chained power-boards are something we commonly encounter in the home and they’re a potential cause of fire, buried as they often are in the back of cupboards, entertainment units and the like, covered in a gradually thinkening layer of potentially fire-fuelling dust. Here’s a simple double-adapter I went to use recently. I gave it a quick visual inspection before doing so and realised all wasn’t well. Opening it revealed the scary truth! So clearly this device has gotten so hot at some stage that the plastic’s started to melt! Yikes! Notice how the colour of the blue wire’s insulation has changed as it neared the source of heat. If you look a little harder you’ll also notice there’s a larger air-gap in the “fingers” on the RH socket compared to the left. With less tension on the fingers to press against the mating plug we introduce resistance and thus further exacerbate the problem. If I was lucky the adapter might have gotten to a point where it arced and spat and the ensuing heat melted the cable or one of the conductors, and in so doing broke the circuit. Or the plastic might have melted first, the dust (or a curtain?) surrounding it caught fire, and up goes the house! The solution was simple: this little double-adapter has had a run-in with a much larger hammer, its metal bits thrown in the recycling. Misshapen pins, lumpy or distorted plastic or cables that are warm to the touch are a sign that thing’s aren’t completely safe. 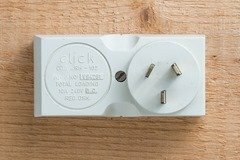 Plugs that sit too loosely in the socket, or easily fall out are an indicator that the plug and socket aren’t mating correctly. Any “arcing” or buzzing sounds from a plug & socket combo means the pins aren’t mating. Don’t just thump or kick it under the desk until the sound stops – BIN IT! If you’re using an extension cord on a reel, unwind it totally before using it so that any heat that might arise doesn’t get trapped inside a tight coil with nowhere to go. If in doubt, don’t use it, discard it or seek professional advice. 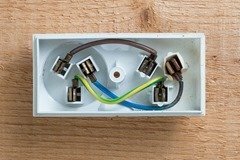 An RCD is hopefully to protect you from electrocution, but it’s not going to prevent a fire from faulty gear like this – that’s where some common-sense and vigilance is going to help. Don’t be lulled into a false sense of security. As someone who has tinkered alot with the good old movement of electrons I can agree that people take electricity for granted. I pulled apart an amplifier at 3. So my kids have the pleasure of breadboarding these days and would encourage anyone to teach their kids the same. One day last year, the first day after an office relocation, I reached over to a power-board sitting along the back of my boss’s desk to switch something off and – WHACK – a very loud expletive launched out my mouth whilst I recoilied from the aching pain of the instantly involuntarily extreme-contraction of finger muscles. My finger had _firmly_ touched on the bare exposed wires of the neon light that would normally sit _underneath_ the translucent red power-switch for that socket of the power-board. The board had been roughly handled during the relocation, and the top of the translucent red lamp-cover had been sheered off, never to be seen again. In my haste to turn something off and viewing the board from a very acute angle, my brain didn’t process the absence of the red plastic bit until it was too late. I had what looked like two snake bite-like points on the end of my finger for a week, cooked flesh, presumably.